Interested in learning more about our research? Explore the links below (click on the photos)! Read some of our recent publications! Think virology research is serious and boring? 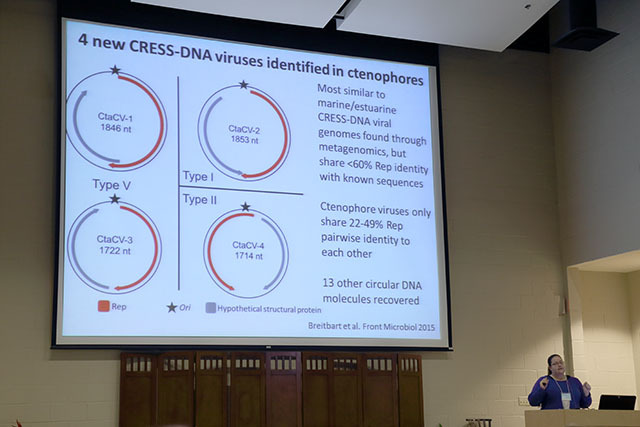 Watch Mya Eastwood giving an exciting seminar about “The Good, The Bad, and The Ugly” of viruses. The Aquatic Viruses Scoop.it! page has many links to recent publications in this field. Mya’s talk about ctenophore viruses from Ctenopalooza 2016! This Week in Virology is an excellent podcast by Vincent Racaniello et al. highlighting recent advances in virology. Our sea star research was highlighted in this episode (~19 min).